This chapter shows off some more complex association mappings. 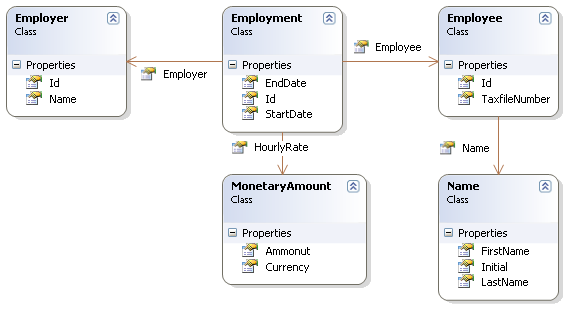 The following model of the relationship between Employer and Employee uses an actual entity class (Employment) to represent the association. This is done because there might be more than one period of employment for the same two parties. Components are used to model monetary values and employee names. And here's the table schema generated by SchemaExport. Consider the following model of the relationships between Work, Author and Person. We represent the relationship between Work and Author as a many-to-many association. We choose to represent the relationship between Author and Person as one-to-one association. Another possibility would be to have Author extend Person. There are four tables in this mapping. works, authors and persons hold work, author and person data respectively. author_work is an association table linking authors to works. Here is the table schema, as generated by SchemaExport. In this section we consider a model of the relationships between Customer, Order, LineItem and Product. There is a one-to-many association between Customer and Order, but how can you represent Order / LineItem / Product? In the example, LineItem is mapped as an association class representing the many-to-many association between Order and Product. In NHibernate, this is called a composite element. customers, orders, line_items and products hold customer, order, order line item and product data respectively. line_items also acts as an association table linking orders with products. These examples have been elaborated from the Hibernate test suite. You will find many other useful example mappings in NHibernate own test suite by searching in the test folder of the NHibernate sources. This case requires mixing column and formula under the <many-to-many> element, which is supported only since NHibernate 5.2.